Gelato World Tour - Cooking With C.C. Note from C.C. : I received this press release and found it fascinating. I wish I was going to be in Austin in May! Afternoon Gelato is one of the highlights of any trip to Italy. I would love to get to go to Gelato University sometime…..
AUSTIN (April 14,2014) –After visiting Rome, Valencia, Melbourne and Dubai, the Gelato World Tour will be stopping in Austin, Texas, May 9-11 at Republic Square. The Gelato World Tour is a competition and celebration of the ART of FROZEN DESSERTS. In the end, the tour will have visited eight cities, five continents, tested hundreds of competitors and delighted hundreds of thousands of people. 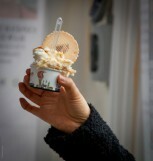 The best gelato artisan in the world will be crowned in Rimini, Italy later in the year. “The city’s interest in diverse food experiences, healthy lifestyle, artistic culture and desire for high-quality locally-sourced food ingredients made Austin the perfect choice for our competition”, stated Achille Sassoli, Gelato World Tour’s Director. With free admission to the public, the tour’s premier event in Austin will present sixteen renowned gelato artisans from North America as they compete to create the world’s best gelato flavor. Visitors and industry professionals are invited to enjoy free lessons, hands-on workshops and delicious instruction on the ancient art of making gelato. Because artisan gelato is made fresh daily with the highest quality ingredients, has less air than traditional ice cream and is served at a higher temperature, the flavors invigorate the palette while the gelato contains fewer calories and fat. This makes gelato the right choice for health-conscious foodies who appreciate the finest flavors and textures. The event is organized by Carpigiani Gelato University, the most prestigious Gelato School in the world, which has thirteen schools on five continents, and the world’s premier expo in artisan food, Sigep-Rimini Fiera. Main partners, as leading manufacturers of showcases and ingredients, respectively: IFI and MEC3. The Gelato World Tour is proud to collaborate with local partners at the Sustainable Food Center and the Italy-America Chamber of Commerce of Texas.